The sun was just coming up, big and bright and yellow. Benjamin Bear was up in a flash. He rushed into the bathroom, scrubbed his face and ears, brushed his teeth and combed the tornado out of his hair. Benjamin had just started school. He really didn't think he liked it very much. He was a little afraid of the school bus with all those kids yelling and pushing. He felt a little lost in those long shiny hallways full of strange odors. Benjamin Bear was worried too. He was afraid he couldn’t ever learn to read and write all those letters! But Benjamin Bear loved to walk! He ran to the window and looked out. It was a beautiful day! "Hooray!" shouted Benjamin Bear. "I can walk to school today." "Benjy! ", called his mother. "Hurry up! Breakfast is on the table!" Benjamin Bear raced downstairs. But something was wrong. Mamma was still in her robe! Why? "You'll have to take the bus today, Benjy. I have some work to finish this morning so I can't walk you to school." "But... but... but, Mamma!" said Benjamin. It was no use. Mama had work to do so Benjamin dragged himself onto the bus. 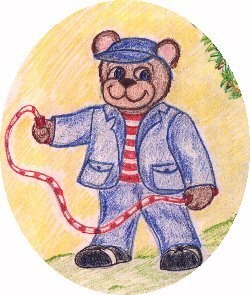 Just as he was getting off the bus in front of the school, Benjamin Bear saw a jump rope lying on the ground. He bent down and picked it up. "Thank you." said a small voice. Benjamin looked around. There was no one there. "Hurry up and put me in your pocket!" said the voice. "Yes, it's me talking." said the jump rope. "Get moving." Benjy nearly fell out of his shoes. He popped the rope into his pocket and raced to his classroom. When writing time came. Benjy started to shake. He was worried that he wouldn’t be able to do it. "Put me on your desk." whispered the little voice from his pocket. Benjamin did. The magic jump rope grew slimmer and slimmer, and then it did something even stranger! As Miss Lovejoy wrote the letters on the blackboard, the rope curled itself into the very same letters, right in his notebook! Benjy was surprised and happy! He followed the outline of each and every letter and soon he was writing up a storm. "Wow! I can write!" laughed Benjamin and he laughed and he wrote, and he wrote and he laughed, from that day to this.